“Remember?” I ask myself while tiredly wiping down my kitchen counters after washing the dishes last week. 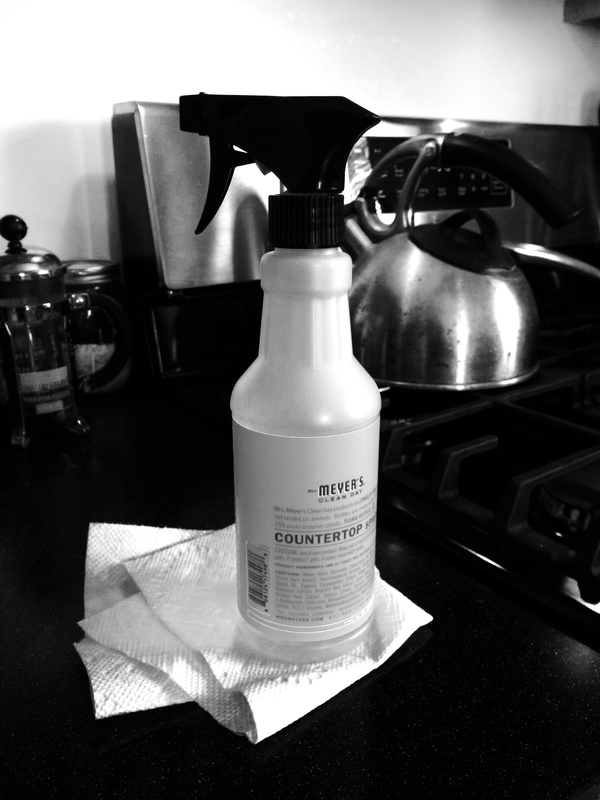 Remember when you made your own disinfectant of vinegar and water with a few drops of lavender oil and tea-tree oil? You scoured the Internet for the perfect natural recipe. You promptly tossed every toxic cleaner and emailed any interested friend the recipe with pride. Remember how pleased you were with the pink and yellow spray bottles you found at IKEA that were the perfect bottles to keep the solution in? Remember how you got rid of every plastic container with BPA? You bought glass containers and you searched online for the most harmless reusable water bottles and recycled lunch bags. Remember how you got rid of your non-stick skillet because you read that non-stick pans released enough toxins during cooking to kill people’s pet birds? I still can’t get my eggs or pancakes off that eco-friendly non-stick pan you replaced it with. Remember how you researched juicers to find the one that would deliver the most nutrients? It had to be the “masticating” kind, not the spinner, to keep the enzymes alive and fresh. And all of the hours you spent looking up doctors and dentists, pouring over reviews trying to find the best ones. You bought matching Sonicare toothbrushes and those little cases for pills with the days of the week so that neither of you would skip your vitamins when you traveled. You filtered your water and kept the “Dirty Dozen” list on the front of the refrigerator. Remember when you researched the top-rated and quietest air purifier so you could protect your husband and yourself from the polluted New York City air while you both slept every night by its soft blue light, in the century old apartment that never felt clean, no matter how much you scrubbed it? Remember how you spent hundreds of dollars on dust mite bed covers that you ordered from a website that listed their pore size in microns and threatened two million tiny creatures would take up residence in a few days without them? No microscopic creatures of any kind were going to find shelter in your bedding. With your allergen-free white duvet cover, quilt and sheets, you’d wake up refreshed, like someone in an advertisement. Remember how, as a part of your newlywed home-making, you bought a first aid kit and flashlights and extra batteries incase of a power outage? You even researched and bought a heavy metal chain rescue ladder to escape from the fourth floor of that Brooklyn brownstone if there should be a fire. You must have felt somewhat under attack, in a city of roaches and rats and bed bugs. In an apartment where you discovered hundreds of mouse droppings in the built in drawers when you moved in and started to clean. You had no idea what they were then, so you just vacuumed them all up. They looked to you then like raw black rice. You had no fire escape. It is frightening to live without an easy exit. This, I will give you. And then for her, it was the same. The carefully researched organic crib mattress, organic washcloths, earth-friendly diapers, paraben-free bath wash and diaper creams. Wooden toys with non-toxic paint, organic stuffed bunnies, and the purest white organic muslin blankets for swaddling- the ones she loved to play hide and seek under later when she was only a few months old. They say in women who have given birth this is partly neurological- changes in the amygdala making us more vigilant, more anxious. It is written into our biology to protect and guard our offspring. So, I can give you that as well. You couldn’t know then, how slim those protections, that your fierce homemaking was never a formidable opponent for such a primitive world. The neighborhood was partly to blame- that gentrified Brooklyn neighborhood of farm to table restaurants, the food co-op where everyone did their grocery shopping, and that local parenting website listing favorite douhlas and midwives with fights breaking out on the forum over gender every time someone posted, “I found a girl’s pink hat at the playground on 7th Avenue.” “Why is that necessarily a girl’s hat?” someone would inevitably reply. The Internet too, I realize, played its role. It was still relatively new then, this idea that from your living room you could research and order juicers, dust mite covers, and air purifiers. It was so easy to get lost in a labyrinth of blogs and websites of other women sharing their recipes for a natural disinfectant, or the dangers of formaldehyde hidden in crib mattresses, or the twelve most pesticide-laden fruits and vegetables to avoid. And although I begin this inner diatribe with bitter sarcasm in my voice, as I wipe the counters one evening last week- “Remember?” Although I initially chuckle facetiously at you for safeguarding your home and your family from invisible pollutants and microscopic mites, with my present knowledge that in just a few years your husband will drown in a Swiss lake thousands of miles from home, my anger dissipates as you come to life in these vignettes. I’ve been too hard on you. Just as I wouldn’t mock the self I see in diaries from decades ago, I can’t ridicule you for trying. I can’t say you were foolish before your husband died in a tragic accident, and that now you are wise. I can’t say you lived in an illusion until they sent home his bag, the one with that vitamin holder and all the useless vitamins you had packed, and that now you see life clearly. It’s never as black and white as that. It is both: light and shadow, love and fear, vulnerability and control. It is easier to blame your neuroticism, your controlling ways, almost as though if you hadn’t been so foolish, you might not have needed this harsh of a lesson, but then aren’t I being just as formulaic as you were? It is so much harder to live in a world both beautiful and terrifying, where despite our best efforts, we are blindsided. Despite our power, we are helpless. Despite our attendance to the microcosmic, the universe is vast. It means injustice in the form of tragedy, but also in the guise of grace. In my mind’s eye I see you now, busily scrubbing down the kitchen sink in your apartment years ago. I put my arm around your shoulder, and stand there silently, invisibly. It’s almost as if you sense my presence. and thank you for those four words Illana- they came to my aid just now. This brought tears to my eyes. I’m a new reader of both your blogs (via Hands Free Mama) and in the week or so since I’ve begun reading about your life, I have been honestly transformed. Your writing has woken me up, unearthed grief I’d hidden because loss hit in early first-time motherhood when that new existence was all I could navigate. I find myself finally processing things 18 months later because of the power of your words. Thank you for sharing your journey. Peace to you. Thank you Jess. Your words are just as powerful to me. May I suggest writing or another art form as a way to start to expressing what you’re uncovering? I truly loved this. My favorite line… “Just as I wouldn’t mock the self I see in diaries from decades ago, I can’t ridicule you for trying.” It’s such a graceful way of looking at our past selves. That we were doing the best we could with the knowledge we had, and it’s so much better to look at our old selves with fondness than with judgement. And our current selves as well, I guess. I really admire your strength and your openness. Thank you for sharing. Oh my goodness, I literally got chills reading those last lines… so so so powerful and heart breaking and gorgeous.